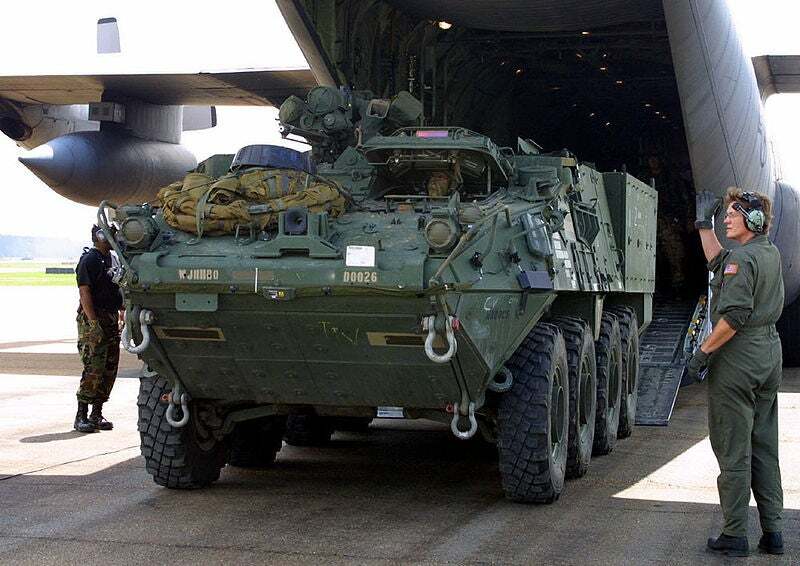 A mortar carrier Stryker vehicle disembarks a California Air National Guard C-130 cargo plane. Credit: US Army. The US Army Contracting Command has awarded a $402m contract to General Dynamics (GD) Land Systems for Stryker system technical support services. Under the cost-plus-fixed-fee contract, the company will provide systems technical support (STS) for the US Army’s Stryker Brigade Combat Team (SBCT) for a period of five years. The company will carry out a range of activities such as log, development, and support of government testing. This will enable high operational readiness maintenance for the soldiers who serve in the SBCT. SBCT is an infantry-centric organisation that seeks to bridge the operational gaps between the army’s light forces and heavy forces. It provides the army with a lethal, deployable, survivable, and mobile option formed around the ten flat-bottom variants of the Stryker vehicle. According to the company, current employees at its operations in Sterling Heights and London, Ontario, will support the contract work. Work on the contract started last month and is estimated to be completed by 31 January 2024. GD is under contract to modify and modernise the Stryker fleet of vehicles, which are considered to be the backbone of the army. Upgrades and improvements delivered to the fleet include the addition of the 30mm, up-gunned Infantry Carrier Vehicle – Dragoon (ICVD), and the Double-V Hull A1 platform. Currently, the army has fielded approximately 4,700 vehicles. Designed to provide seating for nine soldiers, plus a three-soldier crew, the Stryker A1 eight-wheeled vehicle provides the service with increased power, survivability and mobility. In September, the army announced the conversion of the Fort Bliss-based 1st SBCT, 1st Armored Division to an armoured combat brigade. This conversion is part of the army’s efforts to meet combatant commander requirements under the 2018 National Defense Strategy.